Meeting with clients at a coffee shop or in your home does not always help to deliver the message that your company is as professional as you say. When you meet your client at an office business centre “>Toronto Meeting Rooms with a professional atmosphere, your clients are assured that you are serious about the business you are going to conduct with them. Office space Toronto clients at Telsec enjoy free usage of the eight Toronto Meeting Rooms with a professional atmosphere. Each of the meeting rooms Toronto is equipped with white board, internet access, projector screens and audio visual equipment. Toronto office space clients simply go to the receptionist to see which of the Toronto Meeting Rooms with a professional atmosphere is available for the time and date of their meeting. Toronto Virtual office clients can also enjoy meeting rooms each month at the Telsec Toronto business centre or at one of 650 other business office locations around the world. 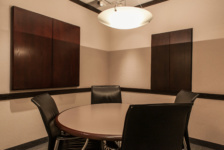 Another way to have Toronto Meeting Rooms with a Professional Atmosphere without having an office space Toronto or a Toronto virtual office plan is to rent a Toronto meeting room for a full or half day at Telsec. 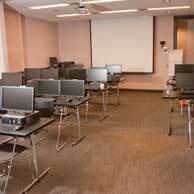 Telsec offers small and large Toronto Meeting Rooms with a professional atmosphere at affordable rates. Telsec also has Toronto conference rooms that are large enough to be used as training and seminar rooms for groups up 50 people. Complimentary coffee, tea and filtered water are included with all meeting room and conference room rentals. Your clients are greeted by a professional receptionist who calls you when they have arrived, giving the appearance that you have an office at this location. Having a meeting, sales conference or a training seminar? 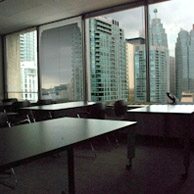 Telsec has Toronto Meeting Rooms with a professional atmosphere that will fit your needs. If you are planning a full day meeting or conference and do not want to leave for lunch, we can arrange catering from simple sandwich trays to a full warm lunch.